WASHINGTON, D.C., June 16, 2015 - Near the end of the movie Apollo 13, which depicts the harrowing journey of the three astronauts aboard the aborted 1970 lunar mission, the tension mounts in textbook fashion. As the spacecraft hurdles into Earth's atmosphere it is encircled by hot ionized air that cuts off communications with NASA Mission Control in Houston. Each second that the flight controllers' calls for contact remain unanswered is torturously stretched. 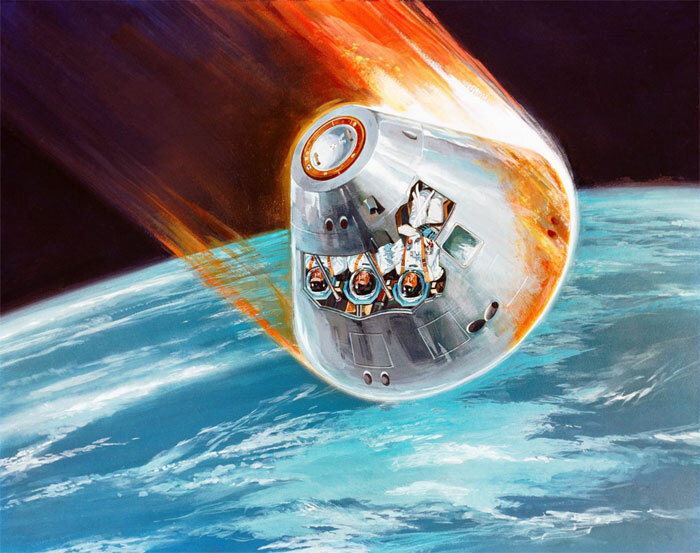 "When a re-entry vehicle is unable to be connected, the only thing you can do is pray for it," said Xiaotian Gao, a physicist at the Harbin Institute of Technology in China. Gao and his colleague Binhao Jiang have proposed a new way to maintain communication with spacecraft as they re-enter the atmosphere. The approach might also be applied to other hypersonic vehicles such as futuristic military planes and ballistic missiles. They discuss their approach in this week's Journal of Applied Physics, from AIP Publishing. Communication blackouts with hypersonic vehicles occur because as the craft zips along at five or more times the speed of sound, an envelope of hot ionized air, called a plasma sheath, surrounds it. This plasma sheath will reflect electromagnetic signals under most conditions, cutting off connection with anything outside of the vehicle. However, under certain special conditions, a plasma sheath can actually enhance the radiation from a communication antenna. Gao and his colleagues reasoned that it would be possible to replicate these special conditions in ordinary hypersonic flight by redesigning the antenna. The researchers first analyzed earlier experiments and found that the special signal enhancement could be explained by a resonance, or matched electromagnetic oscillations, between the plasma sheath and the surrounding air. They propose adding a "matched layer" to ordinary communication antennas to create the desired resonant conditions during normal hypersonic flight. The matched layer works because it acts as like a capacitor -- a type of electrical energy storage unit -- in the antenna circuit, Gao explained. The plasma sheath, on the other hand, acts like an inductor, which resists changes in an electric current passing through it. When a capacitor and an inductor are paired together, they can form a resonant circuit. "Once the resonance is reached, the energy can be exchanged between them steadily and losslessly, like real capacitance and inductance do in a circuit," Gao said. "As a result, the electromagnetic radiation can propagate through the matched layer and the plasma sheath like they do not exist." For the resonance to work, the thickness of the matched layer and the plasma sheath must be smaller than the wavelength of the electromagnetic waves used to communicate, so the approach would be ineffective if the antenna frequency were too high, Gao noted. The properties of the plasma sheath can change during flight, but Gao and his colleagues believe their matched layer can adjust for these changes if it is made from a material whose electromagnetic properties can be tuned with an electrical signal. "We don't need to know exactly the properties of the plasma layer, but we need to know the ranges for these properties. The matched layer will be adjusted by an automatic control system, so we only need to know the ranges to make sure this whole system can work appropriately," Gao said. The team is not the first to try to solve the communication blackout problem, but their approach has advantages over other attempts. For example, the equipment needed to implement the matched layer is much lighter than the equipment required by other methods, such as trying to control the electrons in the plasma with an applied magnetic field, or injecting a liquid into the plasma to reduce its electron density. The matched layer approach also doesn't rely on a particular shape of vehicle to work, doesn't consume additional energy and can adapt to changes of the plasma sheath.